Residents of Wilmington, NC enjoy miles of coasts, convenient shopping, and well-regarded active adult communities. Located between the Cape Fear River and the Atlantic Ocean in the southeastern corner of North Carolina, Wilmington boasts an incredibly rich history, is minutes away from three beautiful beaches, and boasts modest temperatures, making it one of the top retirement destinations in the southeast. Wilmington, beyond anything else, is a mecca for history buffs, with buildings dating back to pre-Revolutionary War days. Named in 2008 by The National Trust for Historic Preservation as one of its Distinctive Destinations, this charming coastal town has seven National Register Historic Districts, tons of historic homes and museums, the Battleship North Carolina, Fort Fisher State Historic Site, among other historic sites. This port city celebrates all four seasons, with average temperatures from May to September reaching around 82 degrees with some humidity, Winter is generally mild, with low around 37 degrees. If it’s golf you love, Wilmington was host to the 2017 Wells Fargo Championship, one of the most prestigious events on the PGA Tour, and is home to numerous championship golf courses. Tennis lovers also love Empire Park, which includes 19 courts and a clubhouse. Three charming beach towns are just a short drive away from Wilmington. Family-friendly Carolina Beach has world-class fishing, a state park, and a scenic boardwalk. Wrightsville Beach offers surfing, kayaking, paddleboarding and other water sports. Kure Beach is a natural beach with an oceanfront park, the oldest fishing pier on the Atlantic Coast, and a historic fort. As the center for medical treatment and education, the New Hanover Regional Medical Center offers a wide range of health and medical services. Wilmington’s River District offers a lot of great shopping opportunities within the area’s renovated historic buildings. Malls, boutiques, and shopping villages await you. 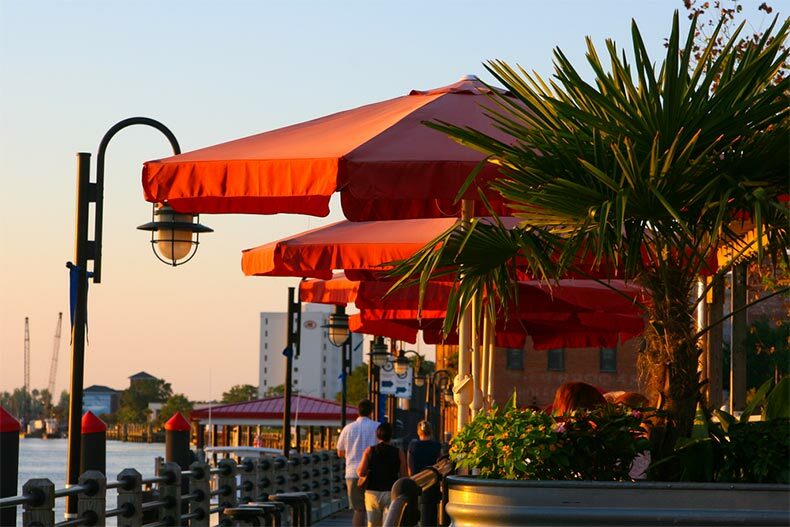 Stroll along the Carolina Beach Riverwalk and visit the shops and restaurants that line it, along with the Port City Marina. The area is also home to the North Carolina Aquarium at Fort Fisher. For film buffs, Wilmington is home to Screen Gems Studios, one of the largest film and television studios outside of Hollywood. If you like theater, the Thalian Hall Center for the Performing Arts, which has been in operation since 1858, hosts about 250 events a year. There are also more than 20 regional theater companies in Wilmington, such as Red Barn Studio and City Stage. Wilmington, North Carolina combines the best of history, culture, fun, and beauty into a place where you’ll enjoy the best years of your life.